Even though we have finished with our formal color exploration, I like to have activities throughout the year at different times to reinforce our skills. I spent this weekend at the dining room table surrounded by flyers, circulars, and weekend adds--all weekend. I wanted to cut out pictures with different colors for this project. The trick was trying to find enough pictures for each of the colors. Yesterday I made little "mats" for each child. The mats were separated into different parts. 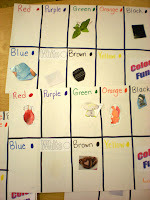 Each one had the color name, in the color, along with a little color dot. Today I put out all the pictures and glue during free time. 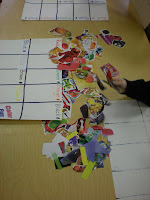 The children were to look through the pictures pick one out, determine it's color and glue it in the correct space. Some of the children finished the whole thing, while others did a few then went on to other things. 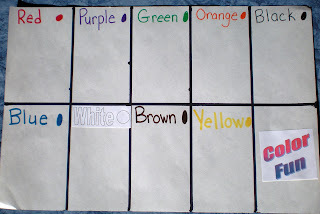 May I ask, I would love to know the answer:) when you set this activity out during free choice open centers are you helping them or are they able to complete it all on their own. Out of all the children that participated in this activity only one needed help. All the others were able to complete it on their own. Thanks for asking. Great idea! And what a fun way to assess retention of colors. I did something similar with the alphabet. We made a food book and my 4 year old cut out photos of food for each letter of the alphabet. This was a long-term project and she also like calling it her menu. She would have me order food from it. Too cute! Jen- Creative and Curious Kids!